Moving from one location to another can be stressful enough for the people involved, let alone the animals in your life. Having one or multiple pets can provide an extra challenge to your move, and may bring about some obstacles that you wouldn’t otherwise have. But there are several ways in which you can make the move seamless and stress free for both you and your pet. 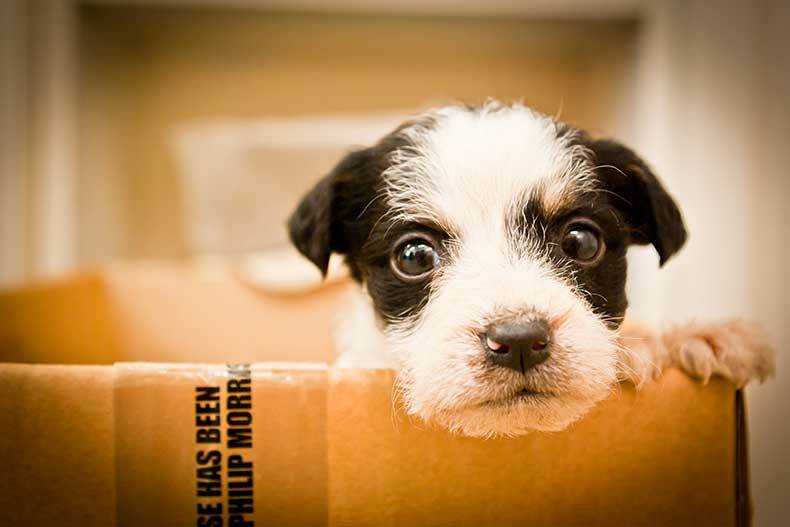 Follow these guidelines to ensure that your dog or cat has a pleasant moving experience. Are your animals used to being inside a pet carrier? If not, you’ll want to prepare them for the experience beforehand by giving them some time inside a properly sized carrier. Introduce them to it slowly by leaving treats and food inside the carrier to show them that it’s a safe and comfortable place. Next, you’ll want to get your pet used to riding in the car. Some animals are uncomfortable with car trips, and may feel sick or overwhelmed. Gradually comfort them by starting out with short car rides, helping your pet get used to the sensation of riding in the car. The feelings, sounds, and sights will start to become more familiar, and soon they will be able to sit comfortably in their carrier during a car ride. If you have a dog or two, you can introduce them to the neighborhood before the move by taking them for walks around the area. Let them experience the exciting new smells and sights that the neighborhood has to offer. Then, when the move officially happens, it’s as if they are moving into their already established territory! A pet will need to gain familiarity with the home in their own time. It can be a very overwhelming experience for most animals, especially cats. An animal who isn’t used to moving around will need a lot of time to leave their carrier, let alone explore the house. Once curiosity takes ahold of them, they can start to explore. Make sure the house is free of any dangerous obstacles, such as dangling wires or small objects that they can put in their mouth. The dog or the cat will want to sniff every nook and cranny, discovering this new home on their own. Make sure to spend plenty of time with your pet in the new home. They will want to feel comfortable, and your presence can ease their fears and help them understand that this is their home too. Give them plenty of food and treats, and put out their toys so they have a sense of familiarity. In no time, your dog or cat will establish a familiar daily routine, find their favorite sleeping spot in the house, understand where their toys are, and be back to their normal and happy selves. One thing that all animals dislike the most is spontaneity. Establishing a base routine with your pet can greatly minimize their anxiety and give them an understanding of safety and normalcy. Whatever routine you had established in your old home should be upkept in the new home as well. Feed them at the same time that you always fed them, take them for walks during normal hours, put them to bed at night, and establish fun outside time if needed. Most importantly, be patient with your pet. Each animal is different, and some furry friends need more time to adjust than others. By keeping up a familiar pattern and allowing your pet to establish comfort on their terms, your pet will be happy and stress-free in no time.